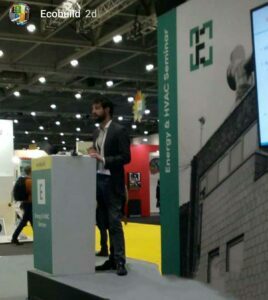 Logic4training’s Alyssa Salazar had the chance to visit the Ecobuild 2018 Show at the Excel Centre in East London. Here is a brief look at some of the highlights from Tuesday 6th March. Ecobuild 2018 is a massive show that is designed to bring the future of our industry to life with the latest technology, fresh ideas and thoughts, and the most innovative materials. This event brings together the most innovative, exciting and inspiring brands, companies, speakers and experiences, making Ecobuild one of the key events in our calendar. As I entered the event, I was almost overwhelmed with all the incredible stalls and displays. The layout was incredibly organised with colours and names for each section that slowly guided me to the next area. Several companies were showcasing their renewable heating technologies, smart technologies, and clean energy solutions which have become more cost competitive over the last few years. 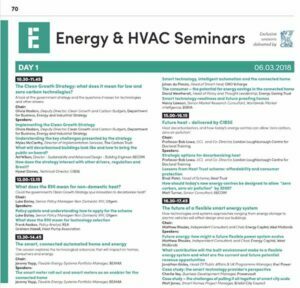 I found myself listening to most of the Energy and HVAC Seminars that discussed the current situations and future of the heating and energy industry. The first Seminar that was held was a discussion about the Clean Growth Strategy and what it means for low and zero carbon technologies. The Clean Growth Strategy was published in October 2017 and commits the government to reduce emissions by setting out a range of policies and proposals for energy reduction and carbon emissions in the construction environment. The strategy sets out ambitious challenges of creating a prosperous decarbonisation through to the 2020s and early 2030s. The Clean Growth Strategy has started to design a path towards addressing these issues and drive the adoption of low and zero carbon technologies, but for decarbonised heat, it is not yet clearly defined. The next seminar was about what RHI means for non-domestic heating. Due to the Clean Growth Strategy, the Non Domestic RHI is providing financial incentives to increase the uptake on renewable heat, such as heat pumps, biomass and biogas in homes and businesses with eligible installations receiving payments over 20 years, based on the quantity of heat generated. Ecobuild 2018 was an incredible experience to see how the building industry is striving towards green innovations and are taking on different ways to protect the environment. I can’t wait until next year to see what new innovations will be bringing our future forward. 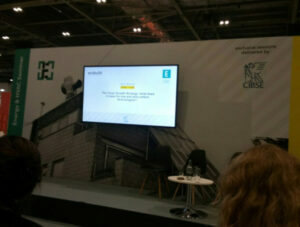 A BIG thank you to Ecobuild for all their hard work to make this event so great.